1st Annual THINC Symposium - Great Success! 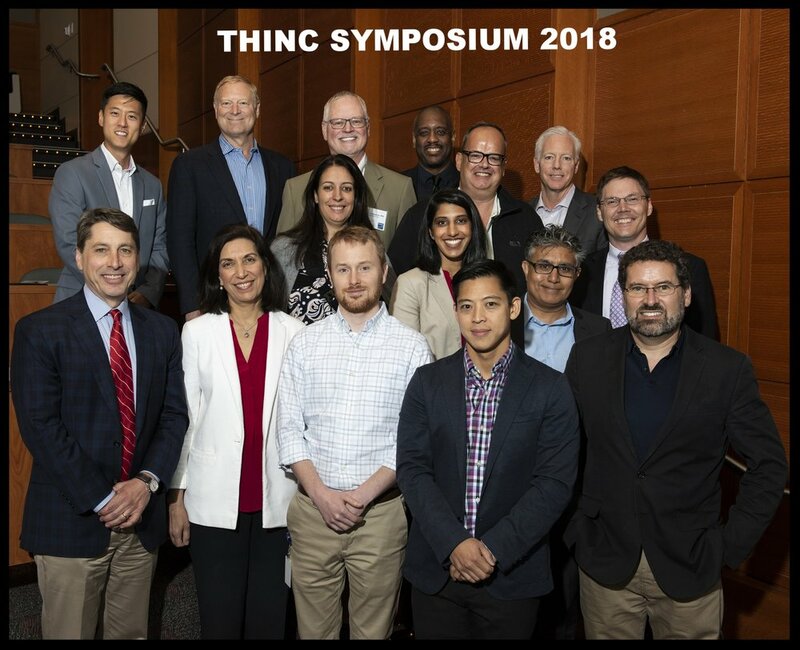 Distinguished leaders of studying and drugging gene control in both academia and industry were brought together to further our understanding of diseases of gene regulation, especially RNA and chromatin biology, at the 1st Annual THINC Symposium held May 31, 2018 - June 1, 2018. These excellent speakers brought diverse expertise, which was met with great enthusiasm by trainees, researchers, and anyone interested in gene regulation and therapeutics. Q&A sessions after each talk were engaging, providing an excellent opportunity for participants to interact with prominent speakers on the themes of RNA & Disease, Academic Drug Discovery, and Drugging Transcription! Top Row: Charles Lin, Ph.D. (Baylor College of Medicine/THINC), Richard A. Young, Ph.D. (Whitehead Institute, MIT), Casey Cunningham, M.D. (Santé Ventures), Damian Young, Ph.D. (Baylor College of Medicine/THINC), Paul Clarke, Ph.D. (ICR London), and Michael Foley, Ph.D. (Tri-Institutional Therapeutics Discovery Institute). Middle Row: Silvia Buonamici, Ph.D. (H3 Biomedicine), Noreen Rizvi, Ph.D. (Merck & Co; Siemens Healthineers), Rajesh Chopra, Ph.D. (ICR London), and Trey Westbrook, Ph.D. (Baylor College of Medicine/THINC).